"Kick-off of the North Seas Parliamentary Network"
On 21 & 22 June 2013 in Dublin Castle, the EUFORES 13th Inter-Parliamentary Meeting (IPM13) took place in cooperation with the Irish Parliament and in association with the Irish Presidency of the Council of the European Union. IPM13 was attended by approximately 100 participants, including 50 Members of Parliament from 13 different Member States, as well as high level officials from national governments, the European Commission and selected stakeholders from industry and the scientific sector. This IPM had a special focus on networking among the neighbouring countries of the North Seas on the European, national, regional and local parliamentary level and on mayor's level. Furthermore, on Friday afternoon in a closed session for Members of Parliament, a North Seas Parliamentary Network was established in support of the North Seas Offshore Grid Initiative(NSCOGI). EUFORES President and Member of the European Parliament, Claude Turmes, opened the conference. In his opening speech, he suggested that smart grids were the way to get out of the crisis. The challenges he noted were the problems in connecting the different European regions. He remarked that there was a necessity for more openness in the political arena and for cooperation on the regional level in order to move ahead with renewables and the subsequent infrastructural challenges. IPM13 host, Senator Cait Keane, gave a warm welcome word and introduced the Irish Minister for Energy, Minister Pat Rabbitte, who gave a key-note speech. He denoted that there should be a shift from the dependency on fossil fuels to renewables. 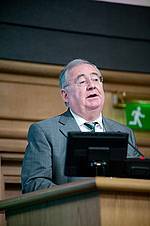 The following session, organised specifically in the framework of Keep-on-track!, was chaired by Senator Tony Mulcahy. Here, Director Marie Donnelly from European Commission DG Energy, presented the EU's roadmap for 2020. She noted that one of the priorities was to look into heating and cooling consumption. Regarding the north seas region, Ms. Donnelly mentioned that the national governments should think about the region as a common resource and think in terms of investing in mesh grid. Josche Muth, EREC, gave an insightful presentation about the Keep-on-track! project findings on the EU Member States' 20% renewables trajectory for 2020.Thomas Becker, EWEA, presented the current situation of wind power investment in Europe and how the financial crisis was affecting national investment in renewables. He called out to the European Commission to intervene. Tony Lewis, EU-OEA, presented the current trends in offshore investments, such as offshore wind farms and tidal energy production. In the next session, several aspects of the North Seas as the future energy pool of Europe were looked at, such as the investors point of view - presented by Eddie O'Connor (Mainstream) and the supply chain side - presented by Brian Britton (NOW Ireland), as well as the necessary grid infrastructure development - presented by Louis Fisher (EirGrid), and the North Seas Country offshore Grid Initiative (NSCOGI), presented by Jan Hensmans (Belgian Federal Government). These four topics then became the discussion topics during the World Café Session. Each table was chaired by a Member of Parliament and the expert from the previous session. The participants moved from one table to the next, which allowed for in depth discussions on each topic. The second day of the conference was dedicated to energy efficiency. Fiona Hall, EUFORES Vice-President and Member of the European Parliament, reported on the EU's energy efficiency policy and the challenges ahead. Ms Hall indicated that there were important developments in the cost reduction area. Ms Hall remarked that the EU needs to start focusing on the national plans for 2050. 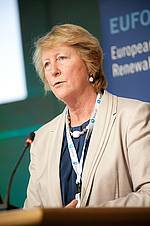 Marie Donnelly, European Commission, presented the new Energy Efficiency Directive. She mentioned that with the new Directive the Commission had a clearer picture about the targets, a roadmap for renovation of building stock and an increased involvement of the public sector. Brian Motherway, SEAI, gave a detailed presentation about how Ireland is promoting energy efficiency. Mr Motherway remarked that finance was key in the investment in energy efficiency. He reported that Ireland had several good examples of good energy efficiency projects such as the Irish military accreditation and the model of energy efficiency followed by the Guinness Factory. EUFORES Secretary General, Jan Geiss, reported on Energy Efficiency Watch project, coordinated by EUFORES. Patty Fong explained how a Guide for a strong implementation of the EU Efficiency Directive could pave way for a competitive EU climate and Energy policy 2030. Adrian Joyce, from EuroAce, finalized the session by giving a detailed presentation about the current situation of buildings in Europe and the best ways to move forward towards a more energy efficient policy. Some of the concerns and suggestions raised by the audience were related with the need of having for each Member State a cost efficiency programme related to buildings. The last session was chaired by the Mr. Turmes, EUFORES president, and it was focused on Energy Efficiency targets for 2030 on a national and EU levels. Mr. Turmes mentioned that after the disappointing outcomes from Copenhagen, it was urgent for Europe to position itself and start the discussion for 2030. Director Donnelly indicated that it was important to have an accurate picture of the when assessing the targets and instruments. Mr. Joyce suggested that an approach which would focus on a longer-term targets, 2050, and then focused on the path to achieve this targets. Furthermore, the conference was accompanied by a Friday gala dinner in the Irish Parliament, including a tour of the Parliament, and a Saturday afternoon educational site-visit to Diageo Guinness Storehouse to learn about their applied energy efficient measures and to the EirGrid Power Control Centre. This was followed by an Irish night with Irish food and a performance of Irish singing and dancing at Johnnie Fox's Pub.